Hikari City was the location for one of the Navy's four kaiten training bases. The Kaiten Monument, erected in 1996, honors Hikari Base kaiten pilots and others associated with kaiten operations at Hikari who died during the war. On November 25, 1944, in the final stage of the Pacific War, Hikari Base for the kaiten human torpedo was established at this site in Hikari City. A kaiten is a human torpedo piloted by one man beneath the sea to crash himself into an enemy ship. Young men, in order to protect the Japanese homeland, piloted kaiten launched in the South Pacific from submarines that carried them. They did not return to this place to live again. We pray that your spirits will rest in peace at your home in Hikari. We vow without fail to tell future children of your hopes for peace. After the above inscription, the black plaque lists 55 names of men at Hikari Base who died, but not all of these men were kaiten pilots. 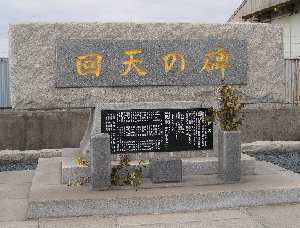 An authoritative kaiten reference book (Mediasion 2006, 78-87) lists 34 Hikari kaiten pilots who died, so some of the other names listed on the monument may be maintenance crewmen who died aboard submarines carrying kaiten. Two kaiten pilots who sortied from another base but who were previously at Hikari are shown on the plaque after the 55 names. The black plaque lists at the end the four ships that were sunk carrying kaiten, their captains, and the number of crewmen who died. There were three submarines: I-370 (79 men), I-361 (76 men), and I-165 (104 men). Transport Ship 18 is also listed with 148 crewmen and 114 men from Hikari Base . This transport ship disappeared for unknown reasons about midnight of March 17, 1945, as she carried several kaiten on the way to Naha, Okinawa (Mediasion 2006, 71). 1. Mediasion (2006, 71) states that 225 crewmen and 127 men from Hikari Base were lost when Transport Ship 18 disappeared. The reason for the different numbers on the monument inscription is not known.